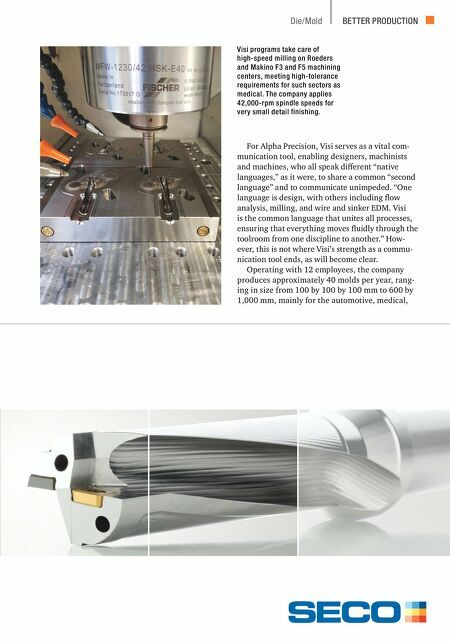 MODERN MACHINE SHOP 103 BETTER PRODUCTION Die/Mold For Alpha Precision, Visi serves as a vital com- munication tool, enabling designers, machinists and machines, who all speak different "native languages," as it were, to share a common "second language" and to communicate unimpeded. "One language is design, with others including flow analysis, milling, and wire and sinker EDM. 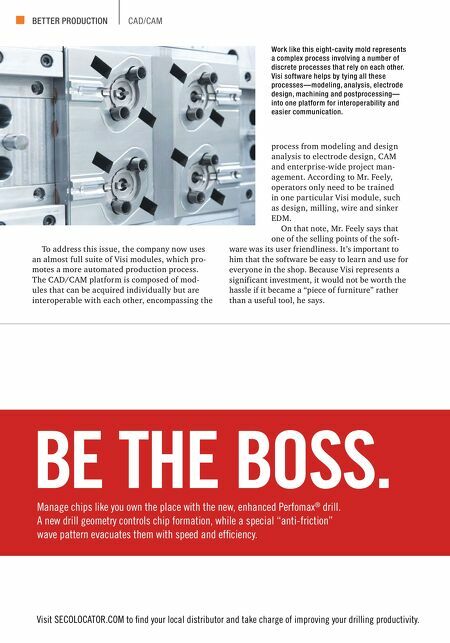 Visi is the common language that unites all processes, ensuring that everything moves fluidly through the toolroom from one discipline to another." How- ever, this is not where Visi's strength as a commu- nication tool ends, as will become clear. Operating with 12 employees, the company produces approximately 40 molds per year, rang- ing in size from 100 by 100 by 100 mm to 600 by 1,000 mm, mainly for the automotive, medical, Visi programs take care of high-speed milling on Roeders and Makino F3 and F5 machining centers, meeting high-tolerance requirements for such sectors as medical. The company applies 42,000-rpm spindle speeds for very small detail finishing.